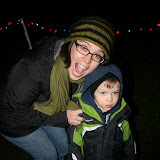 Had a great time last night checking out some x-mas lights with the fam. An old friend came along who had a daughter Matthew’s age. Fun was had by all, pictures turned out good.